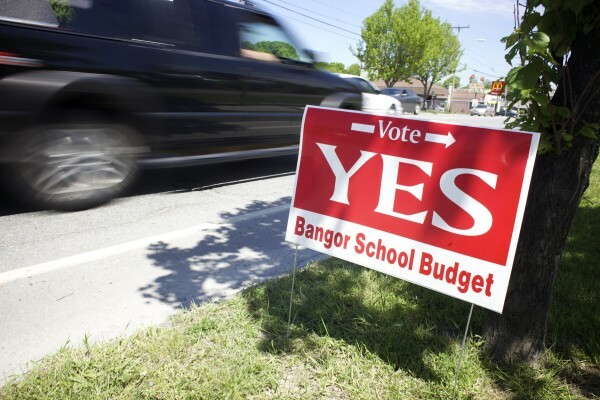 A sign paid for by the Bangor Education Association encourages voters to vote in favor of the Bangor school budget. 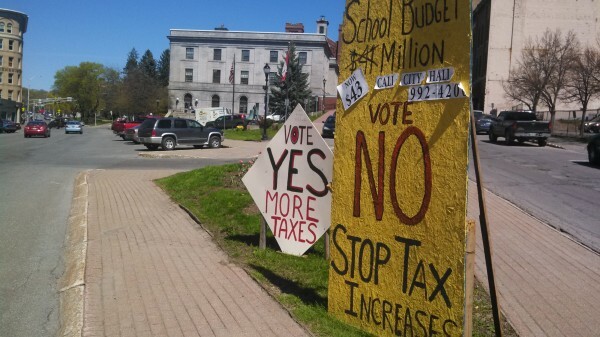 Dueling tax debate signs are seen outside Bangor City Hall recently. BANGOR, Maine — Supporters of the Bangor School Department’s $43 million budget doubled the turnout of opponents at the polls on election night. Unofficial tallies had 2,051 Bangor residents in favor of the school spending plan, 1,081 opposed. The budget for fiscal year 2015 is a 1.25 percent increase over this year and drew criticism from some in the community who argued that a declining population of students should mean a declining cost of education. Over the past six budget seasons, the School Department has lost about $6.7 million in funding. City taxpayers are projected to see a tax hike as high as 5 percent in the coming year. Both the School Department and municipal officials have cited increasing mandates and program expenses with millions in shorted and reduced funding from state and federal sources. An attempt by Bangor City Councilor Nelson Durgin to trim the school’s budget by an additional $178,000 narrowly failed in May after Webb told councilors that any further reductions to the school system’s budget would harm the quality of education in the city. “They did not choose to be educated during a recession,” Webb said, referring to Bangor students. Some, especially Councilor Pauline Civiello, have wanted to see the School Department take a hard look at more drastic ways to reduce this and future budgets — including closing, consolidating or reorganizing the schools with lowest attendance. Bangor city councilors are scheduled to vote on the municipal side of the 2015 budget during a meeting on the night of June 23. Bangor residents also favored Bruce Poliquin over Kevin Raye in the Republican primary for U.S. House District 2 by an unofficial vote of 707-589. On the Democrat side of that race, Emily Cain dominated Troy Jackson by an unofficial tally of 1,177 to 255.